Blog home / Everything CBTN / Could Ubiquiti Replace Cisco? When it comes to professional-grade wireless hardware, there are a handful of top players — Cisco, Ubiquiti, Aerohive, and Aruba. Cisco hardly needs any introduction. They’re practically synonymous with enterprise networking. If you want highly configurable, enterprise-level access points, Cisco is absolutely the way to go. But, Cisco is not always the best by default. In the past few years Ubiquiti has become a household name for wireless aficionados with a taste for easy setup. Back in the day Ubiquiti could charitably be called prosumer-grade equipment, but that’s changed for the better. Both Cisco and Ubiquiti have their strengths and weaknesses. In this post, we’ll compare Cisco and Ubiquiti access points based on their hardware, configuration, and management, and support. We’ll even declare a winner. Cisco has two wireless access point lines — Meraki and Aironet. The Meraki units are arguably some of the most powerful wireless units out there, and they’re also cloud-managed. For that reason, we’ll be using the Aironet 2800 series for comparison here. In either case, we’re talking about APs that start at $500 per unit. Ubiquiti has one wireless access point line — UniFi. The products range from the UniFi AP In-Wall unit to the 10-Gigabit XG Access Point. For comparison to the Aironet, we’ll use the UniFi AP PRO-HD. It’s roughly equivalent to the Aironet 2800 specs, and commonly used in business networking environments. Cisco vs Ubiquiti Hardware: Which is Better? This is a tough area for comparison. It’s not just that the two WAPs we’re comparing are similar. It’s that we chose them for their similarity. It’s not all about the specs. The WAP is the WAP. There are many other things to consider when selecting hardware. Cisco has a couple add-ons that make the 2800 a stronger choice than Ubiquiti in some environments. They are the Smart Antenna and the Cisco Wireless Controller. Signal boosting. Not every WAP placement can be perfect. The Aironet Smart Antenna connectors are the best friend for anyone who has contended with a brick wall when placing an AP. The ability to boost the gain gives those walled off users a fighting chance. Controller. To say that the wireless controller is optional isn’t totally accurate. Unless you want to manually configure each Aironet individually, then you need a Cisco controller as well, which is not cheap. Managing 10 or 20 Aironets without a controller would be madness. When comparing the AP specs, Ubiquiti and Cisco are just about even. That’s the general consensus, even when qualified with “for the price”. It’s not necessarily the hardware that will break the deal one way or another. It’s other factors like the size of network, configuration, management, support — and, especially, price. Configuring and Managing Your Network: Which is Better? Configuration and management are a big deal when selecting APs, and relies on many factors. You don’t want to manually configure and manage every single AP — and certainly not for a large network. When comparing the Cisco Aironet 2800 and UniFi AP-PRO, we’ll be looking at them generally, assuming a clean install. With the Aironet, configuration and management comes down to the Cisco wireless controller. Aironets are highly configurable, and the WLC will give you even finer control over your network. Additionally, Cisco has deep command line configuration.Whether you need all those little (figurative) knobs and dials depends entirely on your environment. If you have a large network with multiple SSIDs, disparate connectivity requirements, guest networks, and any other advanced features, Cisco might be the way to go. However, we’re talking about the wireless controller again. Not the individual Aironet units. Ubiquiti’s answer to the Cisco WLC is a free web-based software. The software lets you manage and configure your wireless network. New units? Just plug them in and the software detects them. If price and ease of use are your key concerns, Ubiquiti is a clear winner. Many networking professionals have scoffed at the idea of running Ubiquiti equipment in a mission critical role, and their skepticism is understandable. In the past, Ubiquiti products had a tough time fitting into the enterprise space. Ubiquiti has been refining its enterprise features, but they’re not quite there yet. Ubiquiti’s CLI is basic at best. They consider it advanced, but compared to Cisco, quite simply, it’s not. Similarly, the controller software has a good basic feature set, like VLAN tagging and device administration, but don’t expect too much for now. We are looking at two very different products when it comes to configuration and management. If you are looking for fine-grain control over a large network, then Cisco is undoubtedly the best choice for your business. If you’re worried about budget and ease of use, then Ubiquiti is the way to go. Ubiquiti software does most of the heavy lifting, and the units can be set up with little networking knowledge. That’s both good and bad. For 80 percent of small networks, Ubiquiti offers a great hassle-free product. Ubiquiti has improved their enterprise offerings significantly. But it’s not quite an enterprise product — yet. Support is probably the easiest place for comparison between Cisco and Ubiquiti products. Quite simply, Cisco is better. Their documentation is thorough. If you can’t find what you need there, you can easily open a TAC Case online. They even provide a support email address and phone number. When you pick up the phone, you’ll get a knowledgeable technician. No one likes turning to support, and not all experiences (or techs) are the same, but it’s easily 8 out of 10 for ease and knowledgeability. Ubiquiti support is lacking. Ubiquiti has a chat window in the controller software. By most accounts, they’re responsive, but only for basic troubleshooting. Ubiquiti also has a good documentation library. Really, the true shining point of their support system is their community. If you start Googling a problem, you’ll likely end up there — and it’s very useful. To answer the question: Yes, Ubiquiti could replace Cisco in your home or office. That comes with a bunch of asterisks, though. Ubiquiti is cheaper than Cisco — by a lot. Let’s say you have a couple dead spots. Throw up another UniFi AP (or two), and you’d still be saving money over Cisco. Not only are the WAPs cheaper, but the UniFi controller is free. That easily shaves five figures off the install. We’ve heard a number of times that Ubiquiti is great for the price, including from CBT Nuggets trainer Jeremy Cioara. He did an entire course about building and configuring business wireless networks with Ubiquiti APs. In that same course, however, Jeremy also says, “You’ll never be fired for choosing Cisco.” That’s also true. Cisco is still the king. 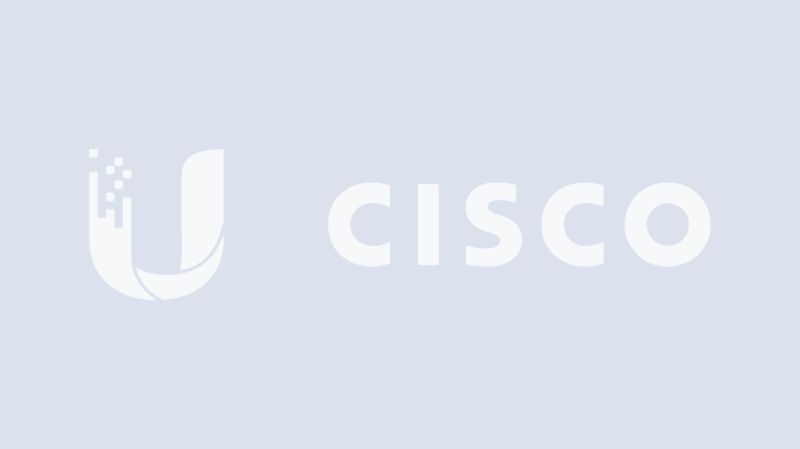 Could Ubiquiti replace Cisco? In some cases, absolutely. It’s really about priorities, existing infrastructure, and technical requirements. Ubiquiti might lack some of the high-end features that come standard with Cisco, but that’s not deterred budget-conscious fans. Meanwhile, Cisco fans don’t mind paying a premium for an enterprise-grade product with excellent support. It’s all about the give-and-take. If you are in a pinch and need an economical solution for your small- to medium-sized business then you could definitely do a lot worse than Ubiquiti products.